First published in 2006, The River of Lost Footsteps: A Personal History of Burma by Thant Myint-U remains an important read a decade or so on for anyone keen on understanding the nuances and richness of Burmese history. While intertwined with the history of his family—the author is the grandson of U Thant, a revered figure in modern Burma—the book is first and foremost an incredibly detailed history of Burma in ancient through to modern times. The book drips with battles and retreats, ambitious growing empires and bloody downfalls through the centuries; if your touchstones for Burmese history are limited, its complexity may very well be overwhelming, but Thant Myint-U’s decision to weave in his family history and thus inject himself into the story saves the book from being a pedestrian dry history you may otherwise be inclined to put aside. Burma’s history is not quite chronologically presented, beginning in the 1880s with the downfall of Burma’s last king, Thibaw, in Mandalay. The almost anti-climactical ejection of the king by the British colonisers is a compelling read. As in the remainder of the book, various historical facts are fascinating: For instance, did you know that the world’s first machine guns had their debut at the British takeover of Mandalay? If you find this account of Mandalay’s fall intriguing, you should also read the fictionalised account by Amitav Ghosh in The Glass Palace, a completely absorbing and beautiful book that should also be on any Burma visitor’s reading list. So buckle up: That’s where you’re headed next! Thant Myint-U explores Burma’s prehistory, and the empires that used the land of modern Burma in their struggles for dominance over the centuries, British colonialism, World War II and the 1962 coup. More of those interesting facts: “The king of Chiang Mai... also sent the lacquerware for which his city was famous, and to this day the Burmese word for lacquer, yun, is the same as the word for the people of Chiang Mai”; “In 1761 an enormous earthquake raised the entire coastline by five feet”; and so very much more. It’s at times dense reading, but Thant Myint-U’s coverage of his own interactions with his home country help to keep it all going and lend some perspective to the history. And though naturally the book doesn’t cover the more recent developments in Burma, if The River is to your taste, consider Myint-U’s more recent book, Where China Meets India: Burma and the New Crossroads of Asia, published in 2012. We hope he’s working on a third! 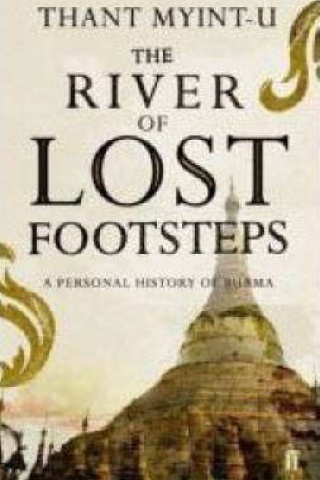 Add The River of Lost Footsteps: A Personal History of Burma if you've got the stamina to read a full-blown history—at 384 pages, this should keep you going on a few long Burmese train rides. To keep things lighter, perhaps consider reading as well The Trouser People, one of our favourite Burma-related books, and you shouldn't miss Orwell's Burmese Days, either.